(Queensland, Australia) - Queensland is home to some awe-inspiring World Heritage rainforests, with the wet tropic Daintree Rainforest in the north and the magical sub-tropical rainforests on the southern border. 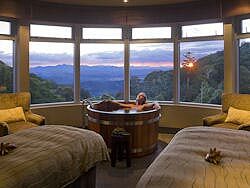 A new and striking travel trend in the region is its retreats, which offer a mixture of the wild and luxurious – of pampering spas in the middle of untamed territory. Experience nature at its beautiful best in these special rainforest retreats. Retreat to the Sunshine Coast Hinterland. The Falls Rainforest Cottages offer six spacious “Queenslander” style cottages for couples to unwind and rediscover the simple pleasures of life. Located outside the charming mountain village of Montville in the Sunshine Coast Hinterland and only 400 meters from Kondalilla National Park, this is the perfect spot to discover the great outdoors. Enjoy a gourmet picnic or barbecue hamper, bushwalking in the national park, or relaxing in the double spa looking out over beautiful natural surrounds. www.thefallscottages.com.au.